I'm such a procrastinator - loving this little reminder from Elise Joy. there's no better way to say it. Me too.. I should probably put the same on my wall!! I'm currently working on bubbles with quotes on my walls! me too... and i totally needed this today. I loved this entry so much! I am the exact same way! I went over to her shop and ended up buying 2 of her journals, and a valentines day card. Thank you so much for the link, I credited you for the find on my blog over at mystyle-file.blogspot.com ! Thanks! i SO need this. i started a blog in which i would write a short story every day for my children. The idea being that i could write the story in the morning, when I am Not Tired, and just read it at night-time, when I Am Tired. So far... i have not even written one. Yes shame on me. 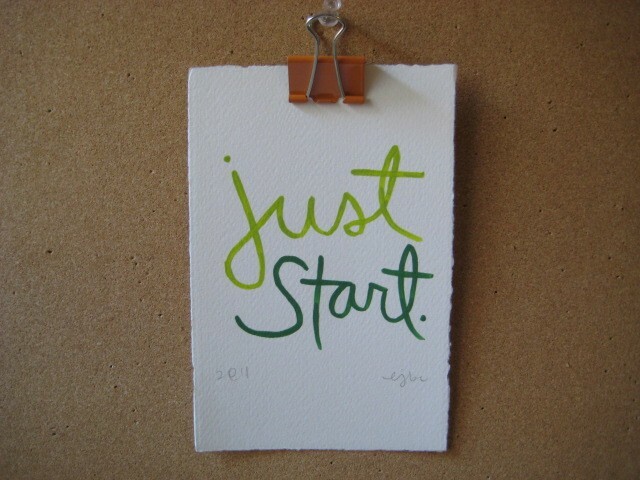 So today, I am going to, Just Start. Let's see if I can.. I need one of those in every room of my house. Thanks for the inspiration.